As much as we might wish they didn’t, appearances and first impressions matter. A first impression can make or break the deal. 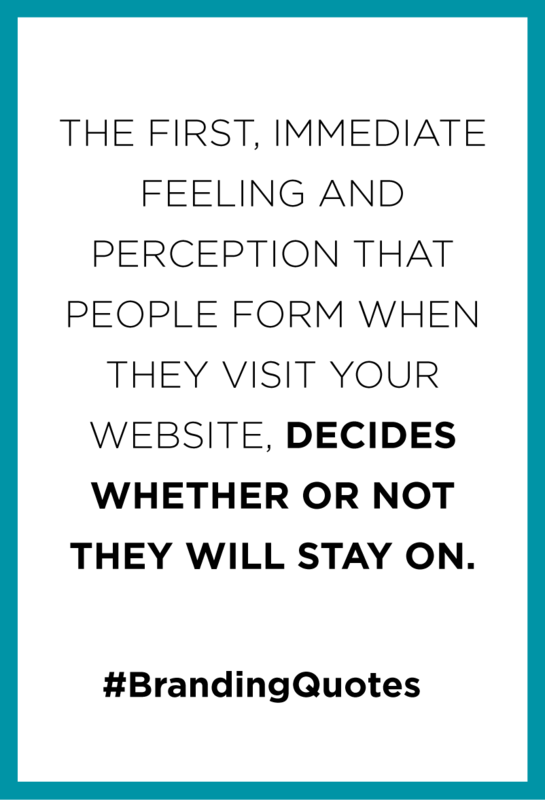 The first, immediate feeling and perception that people form when they visit your website, decide whether or not they will stay on. Research has gone a long way into understanding the behavior of most donors who want to interact with nonprofits. The first thing they do is what we all do these days; they go online and type in your name to see what comes up. The appearance of your website on their screens is the first activity in a decision making chain. It is where they instantly decide whether or not to engage further. The design and structure of your website guide your users into and across your page. It determines whether they leave or stay, to find out more. If your website is too complex or delivers mixed messages, interest quickly fades and the target gives up. Web design that works for you must be crafted to have an immediate initial impact on all visitors. It should capture briefly but deeply your core mission and work. For nonprofits, it is also important that visitors clearly understand your cause. After a quality website delivers its initial task, which is to capture attention, it must then clearly define your work, and contribute to entrenching a strong, positive reputation and opinion of your organization. 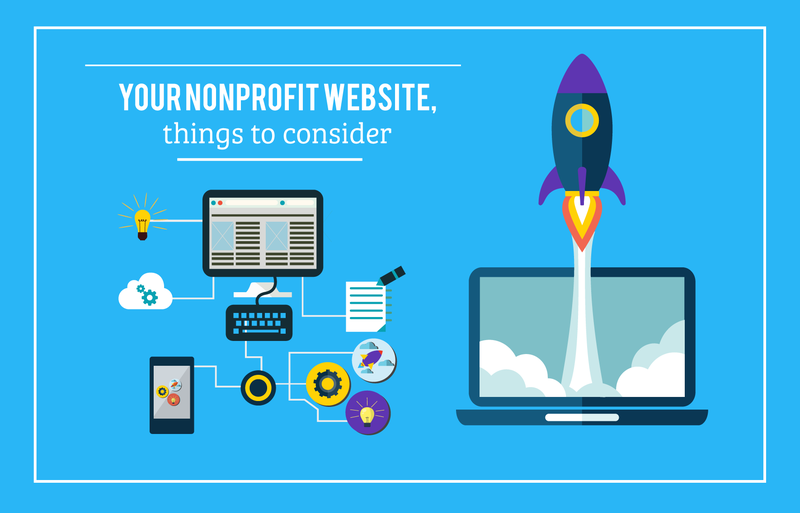 This is why the design and structure of your nonprofit website is so important. It’s not just the face of your organization, it can literally be a make-or-break factor in whether or not a supporter gives or goes. So you are working on the website for your nonprofit, Where should you start? What processes should you implement? The website is a digital representation of your nonprofit. What is your goal for this website? Identify your top goals for your website. These goals should also support your overall mission. Commons goals could be: Expanding your membership or donor base; raising awareness of your cause; or even increasing followers on social media. Feel free to examine many more objectives, and define the activities that will make this happen through the site. Make Your Mission Front and Centre. Your visitors will make decisions as they quickly scroll through your website and its content. Opinions immediately follow and are acted upon. All features of your website, from text and colors used for placement of content, should feed into a fast but deep awareness of your nonprofit and its work. Do not be vague about what you do. Avoid gaps that make it difficult for users to connect the dots quickly and understand what you are all about. You can choose to put part or a shortened version of your mission where it is immediately seen for instance. Use a simple direct tone when describing your mission. It is a common oversight; but most organizations design from their own point of view, and hope that the information provided on the website connects with their audience one way or the other. Your website however, should always serve to bring outsiders into a space where they become interested enough in what you say, to learn more and then engage with you. All the content on your website should work as one, shaping their user experience, explaining your work to them in a way that amplifies their strength and impact as donors has. To optimize your website’s impact, you should always present them with opportunities to take action. This might include creating a platform where people can make contributions, whether for the first time or recurrently. A few practical tips also include ensuring the link to the donation page is visible enough. When they click it and get to the page itself, to ensure that donations take place in the simplest, most convenient way possible. Keep everything on one page, to cut out the time it takes to load pages. If you work with volunteers, you should also ensure that you provide potential volunteers with different ways to get in touch with you, whether this is a specific form they will fill, or a process they have to sign up for, or even if they need to show up at your offices. Let them know so that they can take action. People spend an average of 10 seconds on a website, before they move on. In that 10 seconds, you should ensure that you point them in simple but clear, and interactive ways to the content they are searching for. There should be a logic and clear reasoning and understanding behind where you place different kinds of content. You want to tell your story through your website and then guide people through whatever types of action provided on your page. Structure is therefore important. This may seem like an intensive process but the best way to go about it is to list down and think through your potential visitors, whether the media, or volunteers. Understand what a particular group would be looking for. Use the right tools and incorporate their needs and expectations into the site, and its design. Use images of ‘your people’ as often as possible. Non profits work with people. To tell their stories, to make their lives better. What better to communicate than to use images of people who you’ve impacted through your work? Or your volunteers, and why they have willingly chosen to join your team? Images are powerful than words. They especially evoke a mood or feeling that audiences can relate to your non profit. It is a wise investment to professionally shoot photographs that may capture and express this. Video, is another clever way (motion) to present visual content. Videos allow you to understand the non profit better. We’ve talked about the need to optimize the structure and to incorporate different media. Both of these elements should not, however, overshadow your content and mission. Design for instance, should be carefully applied so that it does not reflect a reality that does not exist. Your content, should guide the design of your website. It is from here that you can then work out and choose the best possible formats for the content you will provide. After you have worked this out, is when you will also have a good idea of what forms of media to use, how many, and the exact places. Ensure that everything looks evenly spaced and tidy; provide enough space for the placement of of other media, to avoid having the content overlap each other. The result is an unprofessional look that can be quite off-putting to visitors. Allow your designers time to get it right. Your Mission: Explain briefly but powerfully, why you exist. Impact to Date: What wins have you managed to gain so far? These prove the point of your work and mission, as well as the need to continue. 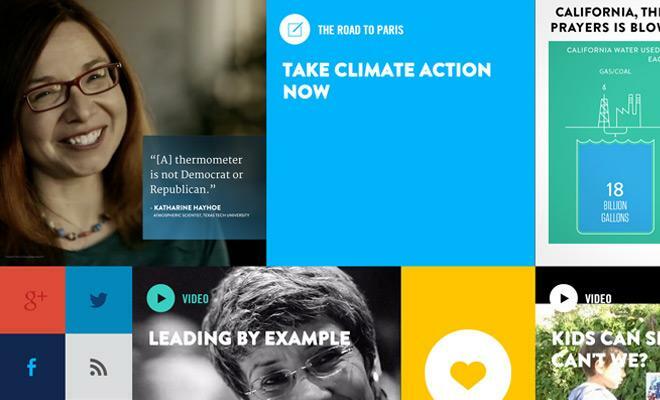 A Call To Action: Consider all your audiences, and the respective actions you want them to take. If your website does its part well, then this should be a decision that comes easily to the audience. Do not forget to clearly guide them to act. Look at the example below. It showcases how design and good structuring can be used without losing the mission. Where possible, use data for visualization. If you are a non profit wondering how to translate dry facts and collected data into content your audience would like and engage, this is the technique for you. This method takes a snapshot every moment, and provides a great way to showcase a situation in a way that really gets the audience’s attention. 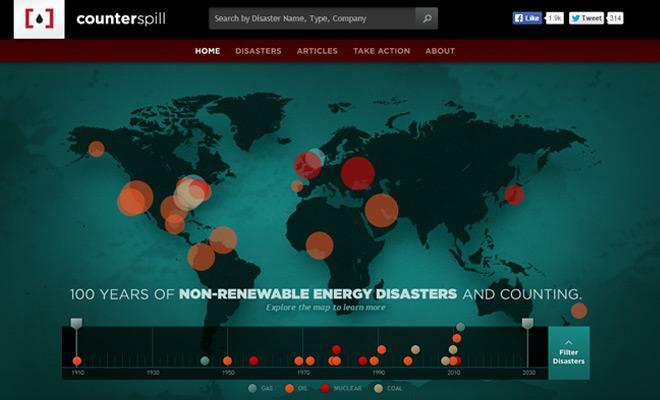 In the example above, found on the CounterSpill website, written text captures the problem in a brief, impactful way, and the visual tells the rest of the story. Instead of having more content visible on the page, you can access it when you move over different parts. The first impression is powerful and when you need more information on something that has caught your interest, you can get it. HungerCrunch above, also visually maps out the areas in which this non profit works. It then provides easy ways to participate, and defines all of them below. Incorporating a game into the donation process is a smart way of ensuring more interaction and participation. 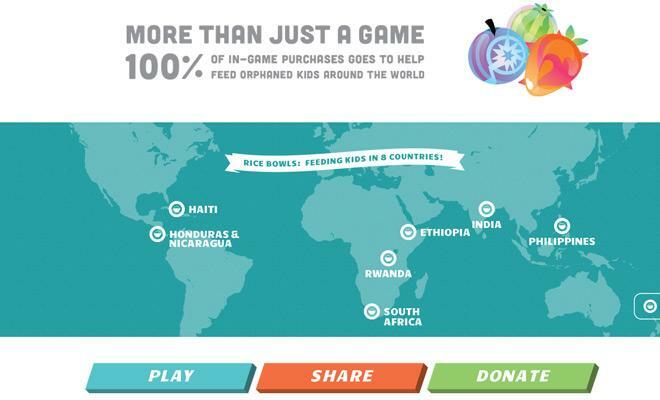 When you buy the application to play this game, you are effectively contributing, and this donation is also visually codified on the landing page as a rice bowl. To what extent have you already carried out any branding activities? Has the process been effective? This can be judged by how uniform or similar the different brand elements, and the messaging work as a whole to shape a single vision. Any website will be an extension of this, for example through the use of similar colour profiles. If this has been done well, then you have a firm base from which you can build your website, and shape the experience in a way that speaks to the overall messaging already in place. Any design work should incorporate these existing cues. If they are not there, then a review is needed, to ensure that the website has an effective presence. How else can you keep branding consistent? Let your website reflect your brand in the same way that other materials, such as newsletters or other reports do. The look and feel should be the same. People will begin to recognize your brand immediately they come across it. For any reports or written content, ensure there are no errors of typos of any sort. Evan one mistake greatly reduces credibility. Consistency allows for audiences to build relationships with you across the spectrum. All your messaging elements need to work together to keep your nonprofit in your audience’s minds. Branding is critical to nonprofits; they need to show who they are as best as possible, in order to engage. Lastly, who will manage the website? If you want your audience to keep coming back to your website, you need to view your website as a living piece of multimedia that must be maintained over time. Make sure someone is responsible for posting blogs, posting updates or at the very least, reviewing content at least every three-to-four months to ensure it is relevant and up-to-date.